It’s easy to tell when people care about a community. Flower beds are tidy. Streets are clean. Architectural heritage is appreciated. Main streets hum with activity. Perth is that sort of place. 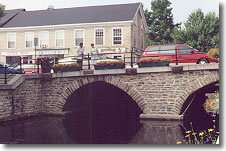 Located an hour’s drive south of Ottawa, the town is the jewel of Lanark County. It well deserves the honour of being the prettiest town in Ontario, given by TVO. It is also worthy of the title “an Ontario Shangri-La” bestowed by former New Yorker Peter Davidson during the 1940's. Driving to Perth along Highway #7 is pleasurable. During the summer, roadsides and fields are a mass of wild flowers. Bogs and ponds full of water lilies and wild iris compete for attention. Rocky outcrops of grey and pink granite, veined with white quartz, glisten in the sun. Closer to Perth, where the land is more fertile, you begin to see log houses, barns and out buildings that are indicative of the architecture of the Ottawa valley. The landscape includes stump, snake and split rail fences and dykes, known also as stone walls. As its name suggests, Perth and surrounding communities have their roots in Scotland. Perth, founded by lowland Scots c1816, has a significant number of buildings in various c1800 through early 1900s architectural styles including Federalist, country Georgian, Gothic and Italianate. Most were built by Scots stonemasons and stand as testament to their ability to work with local materials, that included white, buff and pink sandstone. Even the community’s street names conjure up scenes of “o’er hame” - Gore, Drummond, Victoria, Clyde, Scotch Line. The saying goes that first impressions are always lasting. One’s first impression of Perth is positive, once you turn onto Highway #43, and away from the usual north American fringe-strip-and-mall-sprawl. 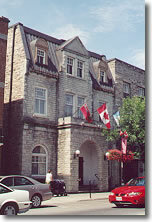 During the 1980's, Perth was chosen as the pilot project for Heritage Canada’s Main Street revival program. Today, as one of the few intact communities left in Ontario that works hard to preserve and restore built heritage, the town is reaping the benefits. It is a vibrant community with an old world charm that lures visitors out of vehicles for a leisurely stroll and look-see. Much of the restored built heritage presents a stunning example of what clear thinking and love for community can achieve. Impressive three-storey commercial blocks house gift and antique shops, hardware and clothing stores, restaurants and bakeries. The core area is dominated by a massive Town Hall with impressive clock tower. Restored Code’s Felt Mill buildings on Foster and Herriott Streets have been creatively joined together and remodeled into shops, restaurants and offices. Take a peek at Ground Waves in the Mill for some unusual gift ideas. While strolling along pretty avenues, drop into Apropos on Foster Street to watch Sheri Linseman create wonderful creations from fresh flowers. The Perkins Building, a c1937 cubed-glass commercial-style former car dealership on Wilson Street, is now the funky and functional home of offices and restaurant. Historic buildings are complimented by huge hanging baskets and street boxes overflowing with greenery and flowers. Stewart Park with its extensive grounds, flower beds and mature trees is an oasis in the heart of Perth. The Tay and Little Tay Rivers run through the Park and provide a great place for children to swim on hot summer days. The River and Tay Basin are an integral part of the downtown area and form Cockburn Island where outdoor cafes overlook water and gorgeous stone-arched bridge work. During the summer, Saturday market is held in a former glass Ottawa bus shelter located behind Gore Street on the bank of the Tay’s ship turning basin. Perth is known for its festivals. Festival of the Maples is held at the end of April. Stewart Park Festival entertains during the fourth weekend in July. A Garlic Festival is held on the second weekend in August and the Agricultural Fair takes place on the long weekend in September. Authors in the Park is scheduled for mid-September while a Pumpkin & Fall Pioneer Festival is held in October as is an annual Artists Studio Tour. Everyone loves the downtown Festival of Lights in early December. In particular, the Stewart Park Festival offers some of Canada’s best touring musicians. Past performers have included Stephen Fearing, Slainte Mhath, Matapat, Colores Andinos and Sue Foley. Those in the know bring folding chairs to enjoy the entertainment on several stages in comfort. As one local fellow said, folks spend the day sittin’ and listenin’ and eatin’. Kids enjoy Flamingo Croquet, Junkyard Jam, and kid-style Snakes & Ladders and Just Horsin’ Around with their own-made hobby horse. For a small town, Perth has an admirable number of places to eat. For lunch or dinner try Mexicali Rosa’s for great California-style Mexican food. Opt for an outdoor table overlooking the river. Maximilian Restaurant is located in a restored c1840's building whose exterior walls are built of cream-coloured sandstone with amethyst overtones. Maximilian’s setting has a European charm and ambience. Customer favourites are schnitzel and pork with sauerkraut. 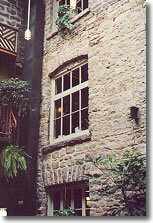 A few miles out of town, Fellinger’s Mill, in a heritage c1840's stone building, serves German and European foods. Try their sumptuous cheese cake served with black currant sauce. The Hungry Planet, located in the Perkins Building, serves innovative lunches and early suppers on a first-come, first-serve basis. The wait is worth the effort. Fiddleheads in Code’s Mill has a great interior, a large patio overlooking Stewart Park and indoor tropical courtyard formed when two buildings were creatively joined together. If you want to enjoy a cup of coffee and pastry, drop into Coutts & Company Coffee Emporium also in the Code Mill complex. There’s nothing that beats hot apple pie with cheese or buttered black current scones with a hot cup of tea and you can get that at Courtyard Tea Room on Gore Street. Sunflower Bake Shop makes the most delicious sandwiches on your choice of freshly baked bread. Try one of their curry buns, cheese sticks or maple butter tarts. 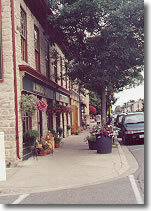 Speaking of cheese, Balderson Cheese is located in the tiny crossroads village of the same name just north of Perth. Cheese making began in the area in 1881. Balderson’s award winning premium cheddar cheeses are sold in their specialty store at the crossroads. Locals know this is the place to get huge ice cream cones. Lanark Highlands provide a number of pleasant surprises. Fergusson Falls, about three miles east of Balderson, is a gorgeous little enclave, not because it is a village complete, but for its collection of log homes and outbuildings. It’s charm includes fields of Scotch Thistles and old fashioned hollyhocks growing by front doors and along fence rows. To the west of Balderson, the village of MacDonald Corners, known locally as “The Hill” has its own charm and share of log structures along with a willow labyrinth, year-round pancake house and maple museum. 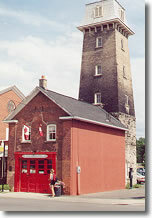 Perth is known for a number of things, among which is that the community was the site of the last fatal duel in Canada which took place on June13, 1833. The body of the unfortunate participant, Robert Lyon, lies in the Old Burying Grounds on Cole Street. Canada’s oldest continuous Brass Band, founded in 1867, calls Perth home and holds summer concerts in Stewart Park. The community boasts a special Garden for the Blind. History unfolds at Matheson House, a c1840's Georgian home which houses Perth Museum with a good collection of material, including the pistols used in the above mentioned duel. A full range of accommodation is available in Perth. For the discerning visitor, the best choice is Wolf Ridges B &B, an executive adult retreat about twenty minutes south of Perth. Reservations are necessary for this luxurious four seasons retreat that boasts an indoor heated swimming pool, library and decks from which guests watch the daily arrival of deer to feeding stations. Breakfasts are sumptuous. Wolf Ridges is a classy accommodation surrounded by 250 acres of eastern Ontario’s unique landscape It is situated next to Murphy Point Provincial Park and the Ottawa-Kingston Rideau Trail network runs through the property. Before you visit, it is a good idea to write for a comprehensive package of area information. If you don’t, one of your first stops should be at the Old Fire Hall on Herriott Street, home to Perth Chamber of Commerce and Downtown BIA. Ask for the self-guided walking tour brochures and leave lots of time to “do the streets”. During busy summer and festival times, reservations are a must as there’s little accommodation outside the area.